This article explains the issues that occur in case of infection with .CORP files virus and provides a complete guide on how to remove malicious files and potentially recover files encrypted by this ransomware. A ransomware strain of Paradise family dubbed .CORP files virus has been spotted in the wild. An infection with this nasty threat leads to the corruption of valuable files all of which could be recognized by the extension .CROP appended to their names. The goal of this ransomware is extortion of a ransom payment. 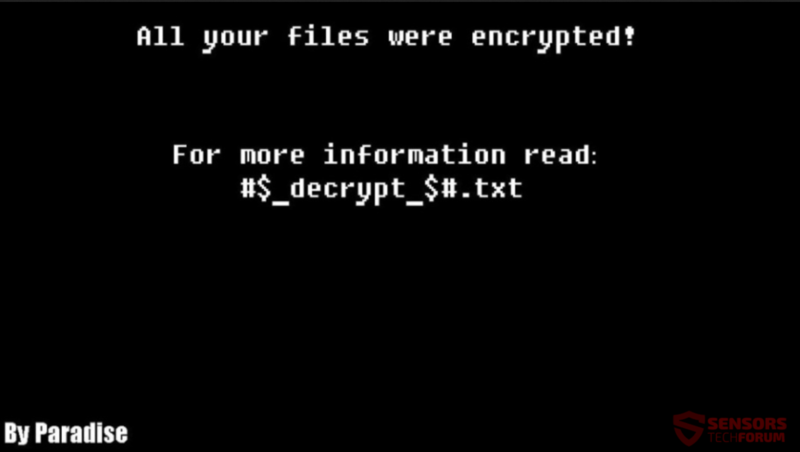 Short Description A data locker ransomware that utilizes strong cihper algorithm to encrypt files so it can demand a ransom for thier decryption. Symptoms Important files are locked and renamed with .CORP extension. They cannot be opened. User Experience Join Our Forum to Discuss .CORP Files Virus. There are several spread techniques that are probably used for the distribution of .CORP ransomware. Malsam is one of those techniques. It is used by hackers for the spread of malicious code via massive email campaigns. They usually embed their malware in files of common types and attach these files to email messages. In addition, emails are often disguised as legitimate businesses or services. The last could be explained by the fact that their purpose is to trick you into opening the corrupted file on your device as this action triggers the execution of ransomware payload. A variety of common file types such as documents, PDFs, images could be transformed into carriers of ransomware code. Invoices coming from reputable sites, like PayPal, eBay, etc. Documents from that appear to be sent from your bank. An online order confirmation note. Malware authors may be also using compromised software installers and infected websites to spread this nasty ransomware infection. These methods enable them to embed the ransomware payload to a app installer or inject it into a web page. Both cases could result in an automatic and unnoticed execution of this payload directly on a target system. With the help of some of the established malicious files, .CORP ransomware could evade detection and reach the main infection stage – data encryption. An additional finding about the impact of this ransomware is that it adds specific executable files in the Windows startup folder. This process along with the process of infecting certain Windows registries such as Run and RunOnce sub-keys makes .CORP ransomware one of the first programs that load on each system start. In order to prevent this nasty side effect you should definitely check your registries for malicious values and erase them all if present. According to further analyses of this .CORP ransomware sample, it is designed to detect infected device’s current language. This command is probably performed in favor of hackers’ statistic purposes. It could serve for the configuration of the ransom amount that may be different for each country. If you want to restore them, write to us by e-mail. Before paying you can send us 1-3 files for free decryption. The file size should not exceed 1MB. The easiest way to buy bitcoin is LocalBitcoins site. write to Google how to buy Bitcoin in your country? Since there is no evidence available whether hackers possess a working decryption tool or a broken one, we recommend you to avoid paying the ransom until you try to cope with this devastating issue with the help of security measures. Since the .CORP files virus has been identified to be an iteration of Paradise ransomware it is likely to follow the same encryption pattern as its predecessors. 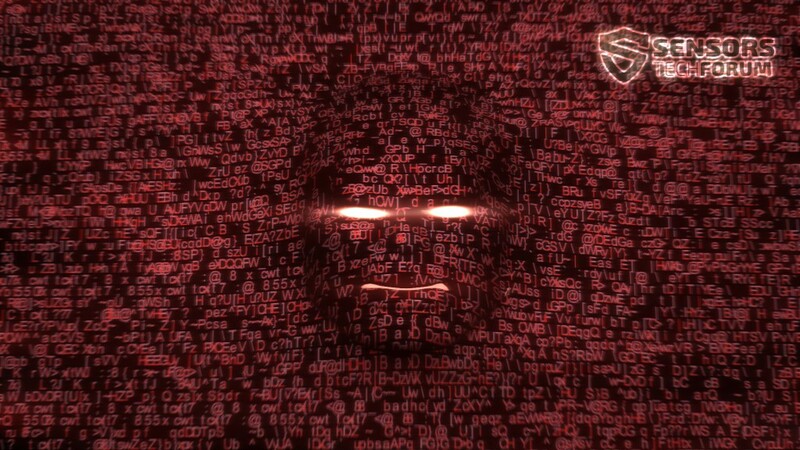 Therefore, your files could have been encrypted with the help of the RSA cipher algorithm. It is a really sophisticated algorithm that transforms parts of the original code of target files and leaves them corrupted. That’s why you cannot open files marked with the extension .CORP. Remove .VACv2 Files virus. Follow the .VACv2 Files virus ransomware removal instructions provided at the end of the article. Remove Paradise ransomware effectively. Paradise ransomware is a RaaS virus. Follow the Paradise ransomware removal instructions given below in the article. The ransomware associated with .CORP extension is a threat with highly complex code that plagues not only your files but your whole system. So you should properly clean and secure your infected system before you could regularly use it again. Below you could find a step-by-step removal guide that may be helpful in attempting to remove this ransomware. Choose the manual removal approach if you have previous experience with malware files. If you don’t feel comfortable with the manual steps select the automatic section from the guide. Steps there enable you to check the infected system for ransomware files and remove them with a few mouse clicks. If you want to understand how to potentially fix encrypted files with the help of alternative data recovery approaches, make sure to read carefully all details mentioned in the step “Restore files”. We remind you that before the beginning of data recovery process, you need to back up all encrypted files to an external drive and prevent their irreversible loss by doing this. Threats such as .CORP Files Virus may be persistent. They tend to re-appear if not fully deleted. A malware removal tool like Combo Cleaner will help you to remove malicious programs, saving you the time and the struggle of tracking down numerous malicious files. Threats such as .CORP Files Virus may be persistent on your system. They tend to re-appear if not fully deleted. A malware removal tool like SpyHunter will help you to remove malicious programs, saving you the time and the struggle of tracking down numerous malicious files. Note! Your computer system may be affected by .CORP Files Virus and other threats. SpyHunter is a powerful malware removal tool designed to help users with in-depth system security analysis, detection and removal of threats such as .CORP Files Virus. 1. Install SpyHunter to scan for .CORP Files Virus and remove them. 2. Scan with SpyHunter, Detect and Remove .CORP Files Virus. Ransomware infections and .CORP Files Virus aim to encrypt your files using an encryption algorithm which may be very difficult to decrypt. This is why we have suggested several alternative methods that may help you go around direct decryption and try to restore your files. Bear in mind that these methods may not be 100% effective but may also help you a little or a lot in different situations. Note! Your computer system may be affected by .CORP Files Virus or other threats. Remove .CORP Files Virus by cleaning your Browser and Registry. Fix registry entries created by .CORP Files Virus on your PC. Combo Cleaner is a powerful malware removal tool designed to help users with in-depth system security analysis, detection and removal of threats such as .CORP Files Virus. Step 5: In the Applications menu, look for any suspicious app or an app with a name, similar or identical to .CORP Files Virus. If you find it, right-click on the app and select “Move to Trash”. Step 6: Select Accounts, after which click on the Login Items preference. Your Mac will then show you a list of items that start automatically when you log in. Look for any suspicious apps identical or similar to .CORP Files Virus. Check the app you want to stop from running automatically and then select on the Minus (“–“) icon to hide it. Remove .CORP Files Virus – related extensions from your Mac’s browsers. A pop-up window will appear asking for confirmation to uninstall the extension. Select ‘Uninstall’ again, and the .CORP Files Virus will be removed. When you are facing problems on your Mac as a result of unwanted scripts and programs such as .CORP Files Virus, the recommended way of eliminating the threat is by using an anti-malware program. Combo Cleaner offers advanced security features along with other modules that will improve your Mac’s security and protect it in the future. Hey !, I found this information for you: ".CORP Files Virus (Paradise) – How to Remove It". Here is the website link: https://sensorstechforum.com/remove-corp-files-virus-paradise/. Thank you.